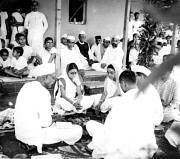 Wedding of Kanu and Abha Gandhi, Sevagram Ashram, 1945. Abha Gandhi spinning at Sevagram Ashram, May 1946. Right: Sita Gandhi. Abha Gandhi spinning at Sevagram Ashram, May 1946. Back: Sita Gandhi. Abha Gandhi at Sevagram Ashram, May 1946. 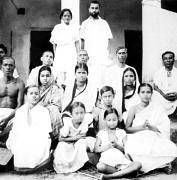 Mridulaben Sarabhai and Kanu Gandhi (top) and others, November 1946. 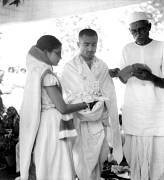 Abha Gandhi and Manu Gandhi with the blood-stained shawl of Mahatma Gandhi, Delhi, February 19, 1948. 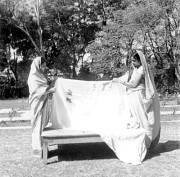 Abha Gandhi and Dr. Sushila Nayar with the blood-stained shawl of Mahatma Gandhi, 1948. Abha Gandhi and Manu Gandhi with the blood-stained shawl of Mahatma Gandhi, 1948.